Vembu BDR suite provides business continuity protection with minimal downtime in event of data loss caused by unexpected disasters. Offsite Disaster Recovery provides extended data protection to safeguard sensitive business data by replicating them from production site to offsite data center for spontaneous data recovery. 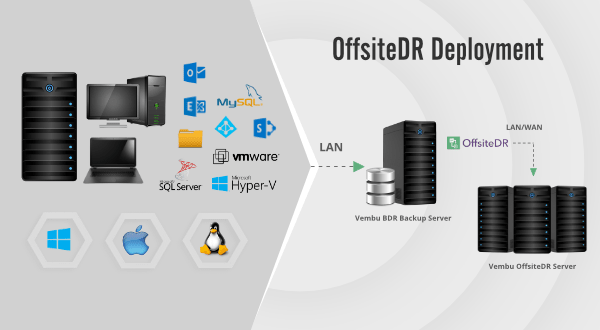 Vembu OffsiteDR helps businesses to minimize the severity of data loss or service interruption in the event of a disaster at production environment. Vembu BDR server is deployed in the production site whereas the Vembu OffsiteDR Server is maintained in a remote data center.